Very few of the runners, stroller-pushing parents, drunks and others who wander into my path each day on the cycle lane up New York’s Hudson River Greenway strike me as especially brilliant people. If they were, they might spot the signs telling them they’re not allowed on the path and stick to the rather pleasant waterside walkway that’s been provided for them. But, disturbingly, the cycle lane obstructors (CLOs) seem to be better at prioritising the risks facing pedestrians than the head of the New York Police Department’s traffic squad. The CLOs have decided that, if they’re going to obstruct traffic, it’s many, many times safer to get in cyclists’ way than cars’. Having so far seen hundreds – possibly thousands – of CLOs in four months’ cycling in New York, I’ve yet to see one choosing to take his or her chances running down the fast-moving, multi-lane West Side Highway next to the cycle path. Yet Brian McCarthy, a deputy chief of the NYPD with responsibility for traffic policing, explained in October to WNYC, the public radio station, why its ironically-named Operation Cycle Safe – the programme that focuses police resources on fining cyclists, rather than the road users that cause traffic deaths – was now mainly tackling riding on the sidewalk (pavement, British readers). This behaviour, he reasoned, posed particular dangers to pedestrians. But, while I can find no recent record of a cyclist’s killing a pedestrian on a New York City sidewalk, it is depressingly regular for motorists to do so through excessive speed or lack of attention. The NYPD barely ever prosecutes the motoring offences that lead to such deaths. Its prioritisation is so skewed that, for it to be correct, I should probably be spotting runners every morning taking their chances with speeding SUVs on the highway, away from the terrifying bicycles. The contrast between the CLOs and Deputy Chief McCarthy illustrates something profound about the vagaries of human beings’ efforts to assess risks. Most humans are reasonably adept at spotting and assessing the most immediate dangers. It’s pretty clear even to a stupid, inconsiderate runner unconcerned about inconveniencing others that it’s less foolish to take the chance of a collision with a cyclist riding at 20mph than a motorist driving at 50mph (the West Side Highway speed limit is 35mph – fun fact that most motorists entirely ignore). Very few people, however, are good at assessing risks in an abstract context such as a decision about how to allocate police resources. The NYPD, as I pointed out in a previous post, hands out 5 per cent of its traffic violation tickets to cyclists, way out of proportion to cyclists’ roughly 1 per cent share of city traffic. But a cyclist last killed someone in New York City in March 2009 – and even that incident wasn’t on the sidewalk. Around 1,000 people have died in the time since at the hands of motor vehicles. A sober risk assessment aimed at bringing down the number of deaths in the city would target an entirely different set of behaviours. The problem appears to be a widespread one. In the UK, newspaper reporting about the crash that injured Bradley Wiggins – one of my great heroes – ended up producing the same, predictable commentary claiming cyclists endanger pedestrians and, somehow, cars. That’s even though the Tour de France winner’s accident involved his colliding with a car that seems to have pulled out into his path from a filling station without looking. In other words, people started complaining on the basis of the kind of accident that happens quite a lot (one where a negligent motorist injures a cyclist) about things that hardly ever happen – accidents where cyclists hurt other road users. The question is whether it’s possible to get better to get better at understanding the risks the roads and other places pose - and to start reacting to them more rationally. turned out to be better at assessing risk than many New Yorkers. My mind’s been particularly drawn to risk assessment in the last three weeks because of events in my new home city. At the end of the week when superstorm Sandy hit New York, I took a trip to Staten Island to report on some of the damage there. Person after person told me they’d ignored the evacuation order for the area on the grounds that a previous hurricane last year – Hurricane Irene – had mostly turned out less damaging than expected. As the sea swept in and inundated their street, they found themselves cowering in their homes’ upper storeys, with waves lapping at the windows even there. A person died in the basement of one of the houses in the street I visited, electrocuted when he stepped into flood water that had electric current flowing through it. The storm was on an entirely different scale from Hurricane Irene. That miscalculation, it seems to me, is of a piece with people’s miscalculations about road use. In both situations, people rely far too much on personal experience and the evidence of their own senses. In the run-up to the storm, it was clear that the city was very windy but not immediately obvious that the storm would cause historic levels of damage. To realise that, one had to pay attention to something one couldn’t see – the vast storm surge that forecasters were predicting that was preparing to push its way into New York Bay to flood large tracts of the city. Many people assessing the risks of cycling, meanwhile, look at cyclists in traffic and conclude that the slender, unprotected machines among the big metal boxes are more vulnerable than most figures actually suggest them to be. They see a cyclist on a sidewalk and assume that his greater speed compared with the pedestrians makes him a significant risk to them. It only adds, it seems to me, to people’s irritation with cyclists that bikes are quiet and people tend to notice them only at the last minute. This seems certain to trigger the kind of last-minute, fight-or-flight response that must have been useful for vulnerable cavemen. It’s a far less reliable indicator than people think of the risks around in a complex, modern urban streetscape. Most people have particular lacunae when it comes to rare events that pose catastrophic risks. A hurricane is precisely such an event. There are fine, hard-to-discern differences between a hurricane that will do little damage – as Hurricane Irene did – kill scores of people and do billions of dollars of damage – as superstorm Sandy did – and one that will kill many hundreds – as Hurricane Katrina did. It is far beyond a normal person’s gut instinct to discern which storms need special attention, yet ordinary people continue to use their gut instincts to assess how they should react. The motorists are blocking the bike lane. The cyclist's too close to the cars. And they'll probably all get away with the risks they're taking. In a road context, the catastrophic events are crashes involving cars, buses and trucks. It’s so common to see motorists driving while ‘phoning, speeding, giving cyclists too little room and so forth that it’s easy to conclude that these behaviours are trivial and pose little risk. Many people compare them with the alarming experience of finding a cycle messenger rush past their nose on a pedestrian crossing and conclude that it’s the cyclist who poses the real danger. The truth is that each time a motorist drives too fast, drives while distracted or turns without looking for cyclists he or she is involved in profoundly risky behaviour – and it’s only the luck of the particular circumstances that divides the outcome from nothing at all and a multiple-fatality crash. People are still more blind to their actions’ long-term consequences. Almost no-one sees a cyclist on a busy street and remembers that he or she is far less likely to die of heart disease or diabetes in several decades than the neighbouring motorist cursing him or her from the exercise-free cocoon of his or her motor car. The global warming that may be making hurricanes more frequent is a still more remote such risk. None of this is to excuse stupid behaviour by cyclists. It’s worth stopping for red lights, giving pedestrians plenty of space and going the right way up one-way streets. It shows an example of good practice and avoids annoying one’s fellow citizens. I do my best to obey the rules. But industries prone to catastrophic but rare risks – the nuclear power industry, for example, or railways – tackle them by looking for the near-misses and minor accidents that suggest people are indulging in risky behaviour. Police forces that hold off warning motorists about dangerous behaviour and minor accidents explicitly miss the chance to follow such a policy. I at least can do my part. I accept that runners will bound into my path on the Hudson River Greenway and cycle at a speed and on a line that means I should avoid them. I know that cars sometimes sweep across even some lightly-used crossings on the route from angles that are hard to see. So I stop for those red lights as other cyclists and runners speed past me, no doubt thinking me an over-cautious worrier. I do my best to assess when I’ve done something foolish and to avoid repeating the mistake. I can only hope that, as New York and other cities start to grapple with a future made more complicated by extreme weather, far more of those around me start to give the matter the same consideration too. Most mornings, as I cycle to work, I smile to myself as it occurs to me that my children and I both start the day by looking at the American flag. But, while the Invisible Visible Children are taking the Pledge of Allegiance at the start of their school day, I’m looking to the flag for a more practical reason. The stars and stripes that fly from the top of the Brooklyn Bridge tell me which way and how strongly the wind is blowing. Since I moved to New York in the summer, it’s been the direction and strength of the wind on the main section of my morning cycle commute – north up the Hudson River Greenway – that’s been the biggest single determinant of how quickly I can make the journey. A following wind can get me there as much as five minutes faster than the prevailing headwind, I estimate. It’s one of countless ways that moving to New York has reminded me of how cycling makes me far more aware than any other way I might travel of nature’s forces. The summer heat is hotter here than in London, where I lived before, and the humidity higher. The rain is less frequent but the cloudbursts more intense. The winter, when it comes, will be more likely to bring very low temperatures and heavy snowfall. But the last week has made me realise that it’s only my constant awareness of the conditions around me that sets me apart from my fellow New Yorkers. Living for the most part on islands on the edge of a bay vulnerable to storm surges, we’re all to some extent going about our business at the pleasure of the elements. And it’s turning out that when nature really pays us back for the presumption of living in such an exposed position bicycles have a rather important role to play. It was when I saw the mixture of embarrassment and pity on the CEO’s face that I realised I would need to change some of my cycling routines to fit New York’s weather. It was late June, I had just cycled briskly to my office in nearly 40 centigrade heat amid high humidity to encounter a colleague unexpectedly asking me to join his meeting with an important visiting chief executive. I had ridden – as I used to do in London – in my work shirt with the sleeves rolled up. In the greater New York heat, I was dripping with perspiration. My shirt was damp enough that my chest hairs were visible. I did my best to make myself look respectable. But, when I entered the meeting, it was clear I was still looking rather freakish. “Looks like you’ve done a hard day’s work already,” the CEO said. The next day, I started cycling in a T-Shirt and changing on reaching the office. The heat and humidity, however, are nothing compared with getting caught in a proper New York downpour. Having cycled regularly in rain in London, I thought myself ready to face the worst a temperate-climate city could produce in the way of rain. Then I set out for home one evening in mid-September amid a deluge that would not have disgraced monsoon-season Chennai. A gutter running downhill on Ninth Avenue had turned into a respectable-sized, fast-flowing, deep river. Every surface was slick with water. The mixture of high humidity, torrential rain and darkness left me struggling to see where I was going. My waterproof jacket became so thoroughly soaked that my BlackBerry, tucked inside a pocket, got fatally wet. It was one of the rare occasions when I regretted the folly of my determination to get about by bike. As a result of that experience, I resigned myself, when I heard that a tropical storm was approaching New York, to weather that would stop me cycling for a few days. On the Saturday evening before superstorm Sandy hit, I took the Invisible Visible Girl by bike to a friend’s house for a Halloween sleepover. By the time I went to pick her up the next morning, the wind was up enough to send leaf debris stinging into our eyes. By late in the afternoon, as I ferried the Invisible Visible Boy on his trailerbike to a playdate with a friend, I was beginning to doubt the wisdom of being out. Every other means of transport gradually came to a halt too. The Monday was a rare day when I dared not cycle anywhere. I monitored the storm’s progress by walking cautiously down to the canal near our apartment. By the evening, I could see water up to the rooves of nearby buildings where we’d walked around earlier in the day. But the same surge of water I could see in the canal was devastating many areas I couldn’t see. 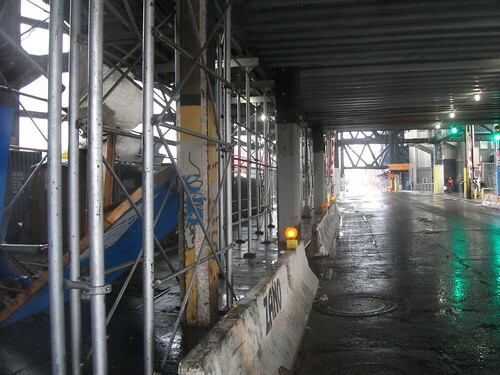 Water was pouring into subway, commuter rail and road tunnels all round the city. It was pouring through the Staten Island ferry terminal in Manhattan and carrying onto the shore the large ship I would see later in the week beached in Staten Island. It was, in other words, knocking out pretty much every means of transport that depends on any complex electrical or electronic control system. It was even shutting down the pipeline that supplied fuel to the city, laying the groundwork for queues hundreds of yards long to appear by gas stations later in the week. As a result, I found myself in an unusual position among my colleagues over the next few days, possessed of the one means of transport that enabled me to consider a lengthy commute into Manhattan. I abandoned an initial attempt to reach the office on Tuesday, discovering in still-powerless lower Manhattan the value of the traffic lights whose numbers in New York City I’ve previously decried. But, skirting round the powerless section via Greenpoint and Queens, I found myself back in the office on Wednesday, able to slip past traffic jams and wheel my bike round downed trees. By Friday, I was volunteering to report from Staten Island, putting my bike on the first ferry after the service resumed. I pedalled my way down to bits of the island where the surge had come up to the ceilings of residents’ ground floors. My main thought was that I was fortunate to live in a part of the city where our main moan was a brief Internet outage and a shortage of bread in the shops. While a man had died in his basement in one street I visited in Staten Island, we had never been in serious danger. But, as I cycled past queues for fuel so long that different gas stations’ lines met each other in the middle and heard anguished stories of islanders’ four-hour journeys to work, I also felt a new appreciation of my bike. New York largely depends on transport systems so overstretched that every extra journey puts a strain on them. I needed little more than a solid surface under my wheels and made few demands on anyone else as I used it. I don’t know how long my bravado in the face of bad weather will continue into the coming, probably harsh winter. The weather is already making it feel more comfortable to be inside than out. But the past week has made me appreciate afresh the flipside of a cyclist’s vulnerability to the elements. I might have felt dangerously exposed at points on Sunday – more exposed than someone using other means of transport. Yet that also reflects cycling’s simplicity – the thing that’s allowed me to keep skipping round the city in a week when others have spent hours in traffic jams or waiting for shuttle buses. New York’s most pressing problem is that thousands of my fellow New Yorkers remain without heat, light and, in many cases, shelter as the weather gets colder. But some hopeful signs are emerging from the post-Sandy gloom. The most impressive is undoubtedly New Yorkers’ willingness to help each other – the pile of donations I saw in church this evening, ready to go from well-off Brooklyn Heights a couple of miles down the road to inundated Red Hook. 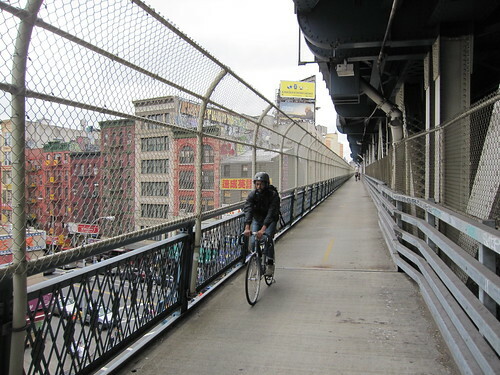 But there was also something stirring about watching the inexperienced cyclists on the Manhattan Bridge on Friday. One knew so little about his cruiser bike he was riding with the kickstand down. Others felt the need for a breather only a third of the way across the bridge. All seemed possessed of a sense that their work or some other business was so important that their physical limitations or experience of cycling shouldn’t stand in the way. As the city rebuilds, one can only hope that at least some of those forced converts experienced at least a little of the satisfaction of experiencing and overcoming the power of nature while cycling. Having seen the vulnerability of the city’s overstretched transport systems to disaster, I harbour at least a hope that some of them might choose to stay on their bikes and keep battling the elements with me.